The best siding option available on the market. Your home will look beautiful! LP SmartSide Siding is the warm, natural look of real wood without the maintenance. It is an upgrade from vinyl siding and a beautiful, durable alternative to fiber cement. 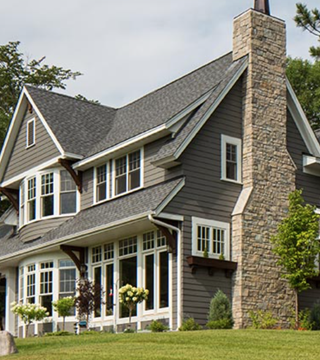 With the extensive array of siding profiles, you can make your home the ultimate reflection of your style. All LP SmartSide products are manufactured with a proprietary SmartGuard process to help resist decay, fungi and termites. All LP SmartSide products come backed with an industry-leading, transferable, limited warranty. It’s the kind of warranty that protects your investment and peace of mind. 5-year 100% Labor & Replacement on LP SmartSide Trim and Siding. 50-Year Prorated Limited Warranty on LP SmartSide Trim and Siding Substrates. LP SmartSide Siding and Trim is made of an engineered wood substrate, a renewable resource with a reduced environmental impact. LP uses SFI certified forest management and procurement systems, which help ensure wood comes from well managed forests. Installation: a cleaner, more efficient installation process with no silica dust, unlike fiber cement products. This provides a safer working environment for the installers and the home occupants. If you are looking to get the most bang for your buck, Smartside siding installed by FM Exteriors is the best choice. In case you aren’t familiar with F-M, we are based just outside of St Louis and we service the surrounding area. We offer roofing, siding, windows, and storm damage repair services, just to name a few! If you are not ready to invest in a high end siding product, F-M Exteriors also offers Royal Group Vinyl Siding. We chose Royal Group Siding because of their unmatched warranties and resistance to fading. Call today and let us help you! If you are in Missouri, call 314.632.6723. If you are in Illinois, call 618.628.1984. If you us to contact you, visit the contact us page and fill out the form.